This blouse was absolutely not planned. I was at Tissus Reine last June to look for trims or something, probably for the swimming suit; I happened to look at the New Look catalogue (browsing the catalogues there is always a treat, as the pictures are so much better and larger than on the pattern companies’ websites). My eyes fell on this pattern, and I just had to get it. Only when the clerk handed me the envelope did I realize that it was designed for juniors. 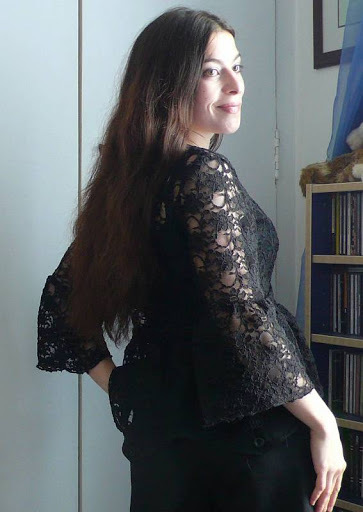 At 27, I might seem too old for a junior pattern; but my measurements still matched, and I am very small (1m54 = just over 5′), so I thought it’d be OK. The measurements are different from the women’s patterns; for reference, I cut a 7/8 for the back and a 9/10 for the front. I could have got away with a size smaller, but this isn’t meant as a fitted top, anyway. Note to self: browse the junior sections in pattern catalogues more often. At the back of Reine’s ground floor (just under the stairs) is a table featuring all black fabrics, often offered at a reduced price (or perhaps it was simply because it was sales time in France back then). Going back downstairs after I’d got the pattern, I happened upon a gorgeous cotton lace priced at 6 euro a metre. Et voilà! Quite serendipitously, a whole project was born. The fabric had a scalloped edge; I cut the bottom ruffles along it. Unfortunately, it wasn’t wide enough to be used at the sleeves, too. This was the first time I did an elaborate project with sheer fabric. There is simply no room for mistake when you work with sheers. Everything will be see-through; every seam has to be perfect. But you know me – right? I love a challenge, as many of us sewists do. At first I thought French seams were the way to go; but it proved too bulky for this airy lace. I ended up serging all the seams with a narrow stitch. The sleeves are hemmed with a rolled hem; the front is bound with satin bias tape. I loved, loved making this. Its lovely and so useful! I really really love it and I think it’s better in black than in white. You did a wonderful job, my dear friend.Gros bisous. Gorgeous! You’ll get a lot of wear out of it this season. I love it. Très Prada-esque, oui? Really elegant I have to say! And very modern with all the lace we see this fall. Go Isabelle! So pretty! You were meant to make this; it was fate! I was a bit behind in blogs, so I had 3 to read from you. You new one looks great again. This kind of fabric will have to wait a while, before I do something with it. J’adore ce haut et je te tire mon chapeau pour les finitions. Et je ne parle pas du noeud que je trouve craquant ! So pretty! You’ll be able to wear this for a long time. Lovely and elegant. Sometimes the unplanned projects are the best ones. That’s a cute little thing – and very trendy with the lace fabric. C’est tout à fait adorable!! !Je craque vraiment! !Et cela te va à merveile!Je t’embrasse. I was going to say exactly the same as Karen 🙂 It’s gorgeous Isabelle! This top is very beautiful and chic. Congratulations on working with lace, it really turned out gorgeous! How lovely! It looks very expensive. Oh Isabelle ma belle, this is gorgeous. And so you! I love it! Love it, and it will be really versitile! Oh, and on the last post, I’d have to have that last black dress, too, except it would be totally wrong for my figure! Hello Isabelle,Fabulous outfit. I haven’t been a junior for many sunsets, but sometimes I do find an idea that I can work with. Great job! Pretty! 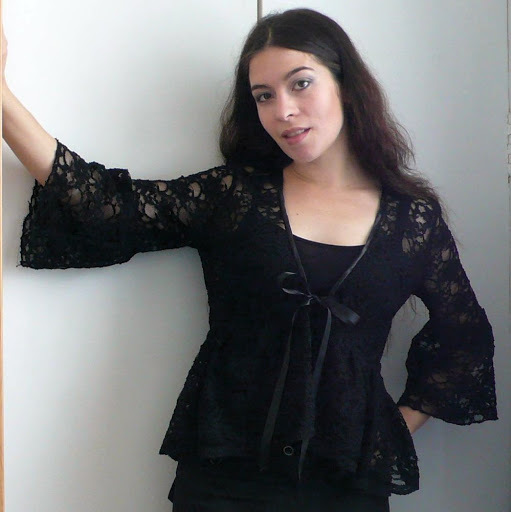 I made a lace overblouse like this ages ago–when I was in college or maybe even high school. I need to pull it out now that it’s in fashion! Such a cool blouse! looks gorgeous! I do believe that fabric and pattern spoke to you. I love the top. You look wow in it, too. WOW, I LOVE this one!!! What a fabulous looking top! Well done, my friend! Love it!! Great choice of fabrics. I also read your post regarding the new Vogue Winter Collection. Have not viewed it all yet, but I agree with your list. The “dislikes”….yes, some odd stuff there indeed. Of your “Likes” list my favorite is the red coat-dress. I also wish I had a more glamorous social life (or a social life AT ALL!!) to wear more fashionable evening wear. I suppose that is why all the dolls get the finest in evening wear that I make. Will post a photo soon of two new dolls on my wish-list. They are designed to be sisters from Paris! The Devereaux Sisters cicra 1920s Paris. Oh, what a dream to be able to dress these two. tu es magnifique!! !une vraie princesse!!! This is beautiful, Isabelle. I’m looking forward to the day I have the confidence to work with lace! 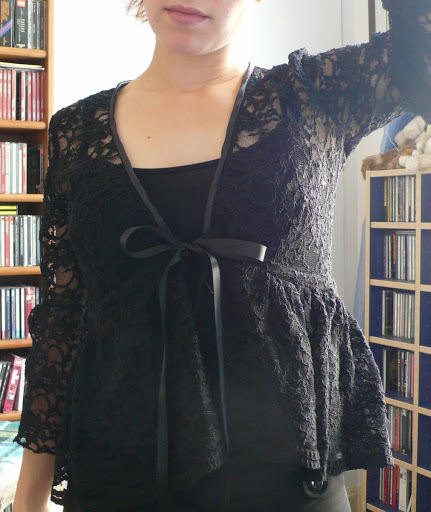 Very Pretty top, and so timely, with all the lace from the fall runways hitting the stores. 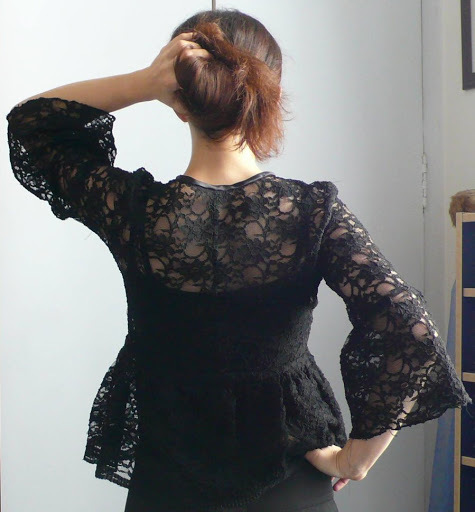 Bonjour Isabelle, j’aime ce top, à vrai dire un genre de tissu que je n’ai pas l’habitude d’acheter mais il te va bien et ca se voit sur les photos.